Before you can even start to put in place new and effective regional governance mechanisms, you have to first find agreement on a rather fundamental question: what exactly is the region that needs to be governed? This problem might appear most acute where there is no regional body to start from – when you are starting from scratch and there is no pre-existing concept of region to perhaps modify, shrink or expand to best deal with whatever the pressing issue of the day is. But even when there is a regional institution – even a relatively long-standing one – there is no guarantee that it entails the right set of states (or other actors) needed to be effective. Does a region established, for example, to deal with a common security challenge provide the right mix of actors required to deal with transnational environmental or economic issues? And what happens when power transitions result in the emergence of new actors that sit outside the existing regional institution? Or when the original security challenge changes? To a large extent, this is the challenge facing regional governance in contemporary Southeast Asia. Or should that be Asia-Pacific? Or maybe even the Indo-Pacific? The lack of clarity on what to call the region says a lot about the competition to define its scope and nature in ways that best serve the interests of key states. This is a part of the world where the longest-standing existing regional institution, the Association of Southeast Asian Nations (ASEAN), has long been in a process of evolution and change. It now includes as members, for example, some of those (former and still current) Communist states that it was originally created to resist. And in1997 the consequences of the Asian Financial Crisis showed that there was much more to the regional economic space than just the member states of ASEAN. Through first financial collaboration with China, Japan and South Korea, ASEAN retained a key role as a provider of regional governance. 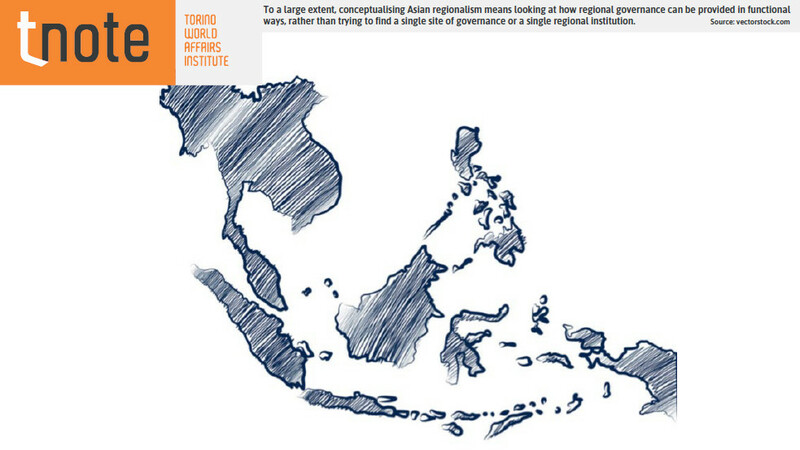 As a result, the idea of region defined as ASEAN+3 began to develop considerable purchase. New forms of collaboration among the ASEAN+3 countries started to emerge, spanning across different dimensions, such as food security surveillance and the provision of a common rice reserve. To be sure, much of the subsequent collaboration between ASEAN and the three was bilateral rather than multilateral in nature. The development of three separate (and very different) economic relationships – the China-ASEAN Free Trade Area, the Japan-ASEAN Comprehensive Economic Partnership Agreement, and the ASEAN-Korea Free Trade Area – is a good example of competing ASEAN+1 processes rather than collective action amongst the +3 states. At the same time, other forms of governance were emerging amongst a small subset of actors rather than including all regional states; for example, in providing forms of environmental regulation along the Mekong River. Nevertheless, while not all partners would be involved in all projects, the idea that this set of actors provided a good starting point for trying to build different types of regional governance had something to commend it. It was a broad understanding of region that also seemed to fit with emerging Chinese understandings and objectives. And herein, in many respects, lies a key problem for region building in Asia; perhaps more correctly two key problems. First, the very fact that it fits with Chinese objectives makes others nervous. They perceive, with some justification, that this understanding of region is favoured and promoted by China because it is a region that China’s leaders think they can exert influence over, in some ways perhaps dominate, and maybe one day even lead. In response, those wary of Chinese dominance – most notably but not only in Japan – have promoted an alternative view of what the region should be. This region is a broader one that includes a set of other countries in Australasia and across to the Indian subcontinent that do not necessarily share China’s ambitions and might act as a bulwark against the spread of Chinese dominance. This idea of region defined as “Indo-Pacific” also chimes with the interests of those in Australia who do not want to become closed off from the economic dynamism of their northern “neighbours” by stretching the very understanding of what constitutes a neighbourhood. The original proposals for the Trans-Pacific Partnership were also (in part at least) built on the attempt to create an alternative economic space; one that excluded China rather than just diluting potential Chinese power. So it is not so much a case of a battle for influence within the region, as concerns about influence and power driving a battle to defining what the regional space should or could be. Second, as European regionalism evolved, there was a relatively close match between the regional economic space and the regional security space. Of course, the membership of regional economic and security institutions never fully overlapped, and countries like Albania would occasionally de-align themselves from their “bloc”. But the nature of the Cold War bipolarity created a fairly clear and holistic understanding of who was the “we” and who was the “them”. At the very least, if a country was aligned with the North Atlantic Treaty Organization (NATO) and the West on security issues, it would not ally with the Soviet Union on economic issues. Crucially, this broad correlation between common and holistic identifications and alliances on security and economic grounds is absent in contemporary Asia. If China once was an economic “other”, it certainly no longer is. China’s economic rise has been built on its integration into the global capitalist world economy, including participation in production networks that have made it an important economic partner for many. Through the creation of the Asian Infrastructure Investment Bank (AIIB), the growth of outward investment in general, and the promise of even greater investment in the future along the Belt and Road Initiative (BRI), China’s leaders are projecting the country as central to the region’s economic future (irrespective of how that region is defined). And unlike the Cold War period, there is nothing to stop countries having regional relations with both the West and China at the same time; bipolarity might have demanded countries have exclusive (economic) relations, but globalisation demands (economic) promiscuity. But while China might be an indispensable economic partner (an economic “we”) it also represents the single biggest security challenge for many of ASEAN member states (a security “other”). It is an exaggeration to say that China simultaneously performs the same role economically that Germany (in economics) and Russia (in security) collectively and (often in conflict) perform in contemporary Europe. But it is an exaggeration that has a faint kernel of truth. All this suggests that region building in Asia is likely to continue to be characterised both by competing economic and security logics and the promotions of different ideas of what Asian regionalism actually is or should be. But this does not mean the end of regional governance: far from it. Rather than trying to find a single site of governance or a single regional institution, regional governance can be provided in functional ways. Groups of actors can come together to establish mechanisms to deal with specific problems in an individual and discrete issue area. A different set of actors operating by a different set of rules might come together to provide solutions to other transnational challenges. And this is already what is happening: witness, for example, the way that individually tailored governance mechanisms have been put in place with different sets of membership amongst ASEAN member states to regulate the palm oil industry, the mining sector, for maritime safety and security, in labour migration and in Islamic finance. Here there is agreement not on one single regional space, but multiple ones.